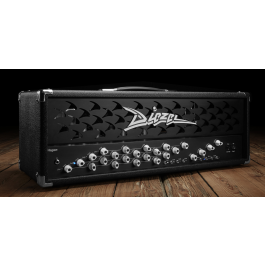 The Hagen is Diezel's answer to the needs of today's axemen: a hyper versatile, modern sounding, four-channel amp loaded with four individual preamps, useful features, easily accessable via MIDI and a strong 100w power section. Hagen covers the whole territory of modern guitar sounds no matter if 6 or 7 stringed. The Diezel Hagen is Diezel's answer to the needs of today's axemen: a hyper versatile, modern sounding, four-channel amp loaded with four individual preamps, useful features, easily accessable via MIDI and a strong 100w power section. Hagen covers the whole territory of modern guitar sounds no matter if 6 or 7 stringed. The Hagen is an extremely heavy, yet versatile amplifier. Not overly compressed and lacking naunce, the Hagen can deliver bone-crunching metal tones and smooth fusion or progress rock tones with just the flip of a switch (or quick turn of your guitar's volume knob). It sort of is a hybrid between the Herbert and VH4, but with a voicing all to its own. These come stock with high-grade JJ KT77 tubes, but can easily be biased for EL34s, 6550s, 6L6s, or whatever sound you're after. Customers frequently ask us how amps such as the Hagen differ from other Diezel models like the Herbert, VH4, Einstein, etc. This is a difficult question to answer, because they are all excellent amps which excell at many of the same things, but accomplishment so in different ways. For example, they all have terrific cleans. They all have great high-gain sounds. They have immense power and punch. Usually the differences lie in the "feel" of the amp, as well as the feature set and of course voicing. We welcome you to give us a call at 508-921-9973 or email us and we can give you our expert recommendations based on assessment of your specific needs.